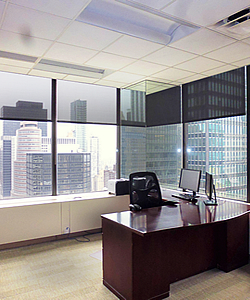 The effect oversized windows have on an office is increased productivity and general wellness. Windows in an office space are typically treated as an afterthought. This may be a problem because windows are difficult to renovate or change. Oversized windows offer an abundance of natural light to the office space boosting morale and efficiency. Larger windows and tinting will add another element to the space. To produce their best work, employees need to feel comfortable especially with temperature, atmosphere, noise levels, and lighting. Office design is dedicated to creating the best working atmosphere ensuring employees are comfortable, in good morale, and productive. It is important to take note of the amount of natural light throughout the office. As you observe the natural light, also note the office design utilized to highlight the available natural light. The placement of workstations is one way to feature natural light. Employee will benefit from the workstation placement by enjoying the natural light. Another option is the use of glass or transparent partitions to allow the natural light to be unobstructed. Architectural glazing is typically tempered or laminated, usually not both. Commonly, the windows are tempered or toughened. The standard thickness of the glass is 6mm. The windows usually contain two panes of glass with approximately 10mm of insulating (argon or krypton) gas between the panes. This may save you a considerable amount on your energy bill. Other energy saving methods may include low emissivity coatings on the outer pane. The location of the building is also important to consider for the types of strengthening used for the glass. The height and location of the building will dictate the heat strengthening required of the windows. Low floors do not require as much heat strengthening as a higher floor. The higher floors need a full temper to avoid any damage or breakage. These extra strengthening measures are beneficial to avoid broken glass raining down to the pedestrians below. Many modern and new office skyscrapers are featuring glass façades and glass curtain walls. Glass curtain walls contain tempered glass, insulating glass, and laminated glass. The glass is glazed to be able to withstand a particular quantity of horizontal load or puncture force, for example a person leaning on the glass. The standard glass curtain wall for skyscrapers, in a moderate climate, is two 1/4" thick panes of glass with a 1/2" insulated spacer. The first glass is coated with a low-E coating. In New York City with so many stunning broad views, many businesses want a higher floor office with large expansive windows. 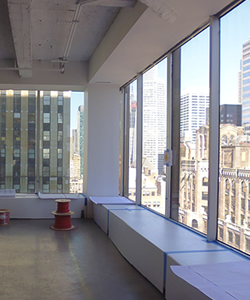 Tenants are requesting functional and creative office designs with lots of natural light and views of the cityscape. A commercial loft with operable windows does maintain some differences from a class A office space. The difference in space types are mostly according to the desired image and function of specific office designs. . In Manhattan, there is a high demand and many businesses requesting office space with great natural light, unobstructed views, and modern design elements. Our brokers are knowledgeable on the available buildings throughout New York City that match the requirements for oversized windows. Our brokers know what office buildings are ideal for your business. We can search and identify any hidden gems. Locating the space with the best of both style and function. Call us today – we can help in your search for the ideal office space at no obligation or fee. .